192 pages | 12 B/W Illus. If you have depression, do you persevere or do you risk telling your manager? If you are a manager, what can you do to support the employee and ensure the job is done? the sensitive issues of disclosure and privacy. 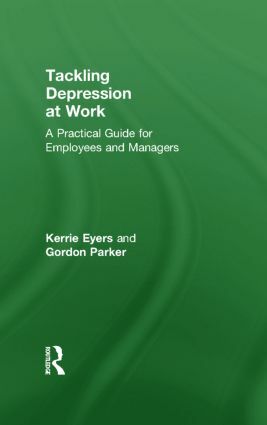 With insightful advice from workers who have learned to manage their disorder on the job, this book offers invaluable support for any worker with depression. It is also an essential resource for all line managers, human resource managers and mental health professionals. Introduction: Some rules of the game. Résumé: To whom it May Concern. Sizing Things UP: The Prevalence of Workplace Disability. Reading the Game: Well-pitched Intervention and Support. When Someone is 'Off Their Game': Signals that Indicate a Problem. Early Intervention Scores Goals: Managerial Strategies. Managing Time-out: Mental Illness and its Knock-on Effects. Support: From the Team and from the Sidelines. Individual Fitness: Assisting Recovery from Impairment. Carrying and Injury Into the Game: To Disclose or Not to Disclose. Agreeing on the Goals: Aligning Worker and Workplace Expectations. Improving the Odds: Matching Personal Skills to the Workplace. Work is a Contact Sport: Contracts that Encourage Fair Play. Stories From the Change Room: People tell about Managing their Mood Disorder. Appendix 1: Measure of Workplace Wellbeing and Happiness. Kerrie Eyers is a psychologist, teacher and editor with many years' experience in mental health, based at the Black Dog Institute, Sydney, Australia. Gordon Parker is Scientia Professor of Psychiatry at the University of New South Wales and Executive Director of the Black Dog Institute, Sydney, Australia. He is a renowned researcher with over 30 years' experience with mood disorders.